In the Bahamas, you can even feed and swim with reef sharks—an experience sure to get your adrenaline pumping. Explore what else makes The Bahamas the most complete diving destination in the world. Unmatched water visibility combined with a striking spectrum of blues and lush coral reefs, makes The Bahamas unmatched as a destination for snorkeling and family diving. Today, more and more people are rediscovering the simple joys of snorkeling and free diving. Whether inland or submerged in the sea, the incredible blue holes of The Bahamas offer a truly unique dive experience. 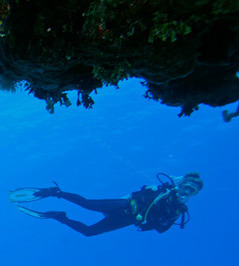 The greatest concentration of blue holes is found inland and in the shallows of Andros Island, where more than 50 blue holes have been recorded. 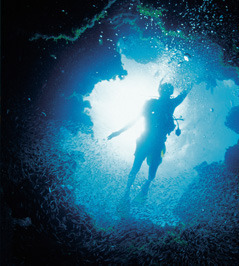 Scattered throughout the island, blue holes, caverns and caves provide spectacular diving experiences. 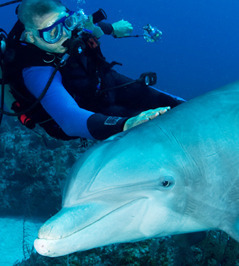 Dolphin encounters are some of the most popular diving experiences in The Bahamas. 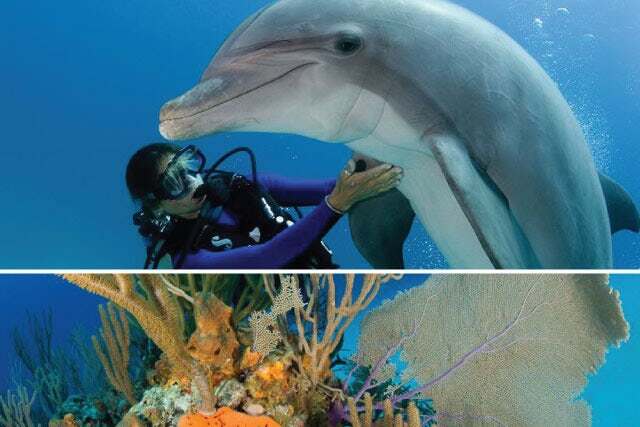 Nowhere else can you find more opportunities to swim with these beautiful marine mammals, in the open ocean or inside a marine mammal facility. Dolphins are not the only big animals in The Bahamas. A shark dive may offer the most thrilling 45 minutes you'll ever spend underwater. 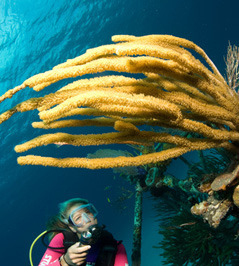 Dive the walls and reefs of The Bahamas for incredible underwater adventure. The world’s third largest barrier reef is found in The Bahamas, along with hundreds of other sites with breathtaking aquatic vistas. Wall diving is not for the faint-of-heart. These great underwater trenches plunge thousands of feet deep. It is along these escarpments that the beauty of coral spires and sponges is fully realized. 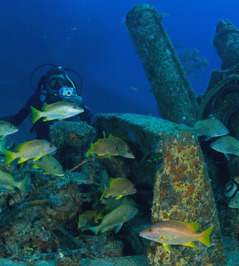 A good wreck is a great dive, and The Bahamas offers many great natural and artificial wreck dives. They can be found in all conditions and at all depths. Shallow wrecks are exposed to lots of sunlight and have an abundant fish life. Congregations of snappers, grunts, angelfish and parrotfish are everywhere. With such exceptionally clear water, there is nothing like seeing a deep wreck from a distance in Bahamian waters.